OwnCloud gives you universal access to your files through web and provides a platform to easily view and sync your data across all your devices. OwnCloud module for HostBill gives your the opportunity to sell and auto-provision OwnCloud-based cloud storage with HostBill. One purchase/account in HostBill results in new OwnCloud user account created. 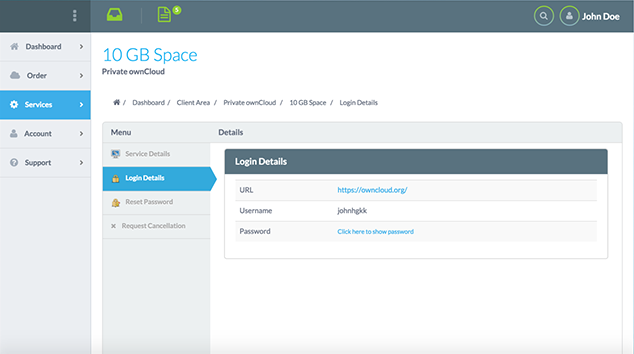 Your client will get separate OwnCloud access to their private cloud space, allowing to manage the private DropBox-like account hosted on your server. With OwnCloud module you have the opportunity to define multiple packages with different price levels for cloud space and user groups from admin area, while your client can easily upgrade the plan when running out of cloud space from our easy to use client portal.